I live outside Chicago (or as you may have heard it referred to this week, “Chiberia”), and things outside are looking rather…tundra-like at the moment. We have about 8 inches of snow on the ground and the air temperature dipped to -22 this morning. Schools are closed; many businesses remain closed; even the mail isn’t going out again today. It’s a good morning to stay inside with a good book. 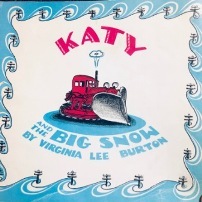 For my 2-year-old son and me, that book this morning was “Katy and the Big Snow,” by Virginia Lee Burton. Do you remember it? Written in 1943 and beautifully illustrated, it tells the story of Katy, a can-do red crawler tractor who works for the highway department of the City of Geoppolis. “The harder and tougher the job, the better she liked it,” we learn about Katy. What a joy “Katy and the Big Snow” has been to rediscover and to introduce my son to. Truth be told, the book was a favorite of my younger sister’s—my own reading interests trended toward books about different countries or historical fiction, less so books featuring vehicles that had names. But now as a parent, and even more so as a working-outside-the-home mom, I’m grateful for this book as an example of selflessness, hard work and perseverance—and for the fact that the protagonist happens to be a blue-collar hero and happens to be a she. Heroines—fictional or real-life—are important. It’s critical for our daughters to have a chance to meet courageous, change-making female protagonists and to share stories of real-life trailblazing women whose backgrounds they can relate to and whose work and impact they can aspire to. But it’s equally important for our sons to meet a variety of heroines, too. What you see is what you begin to expect to see. And I want my son, our sons, to see women and girls who are leading the way, whatever the work they’re engaged in, so that they will expect to see women in leadership roles in their schools, workplaces, organizations and communities. Here’s to getting stuff done. Have you submitted a nomination yet for IWIM 2019? Nominate a colleague, a mentor, a mentee, a professional associate or yourself—submit your nomination today! All nominations due by March 31, 2019. Christine LaFave Grace is managing editor of Plant Services. Christine LaFave Grace joined Plant Services as managing editor in 2015. She is a co-founder of Putman Media’s Influential Women in Manufacturing program. Previously, LaFave Grace worked as an editor at Technomic and at Crain Communications’ Modern Healthcare magazine, among other publications. She has a BA in journalism from Indiana University-Bloomington. A runner, she has completed 10 marathons.